We are the total commercial door repair service company! Exit devices, standard or alarmed. Electronic strikes and Magnetic hardware. 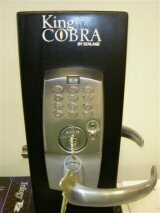 Business safes sold, installed and serviced. Video surveillance systems sold and serviced. Access control systems with time, date audit trails. Pin pad, proximity cards, delta chip technology, bio-metrics and others. High security keys and systems designed, installed and maintained. Master key systems designed, installed and maintained. Interchangeable I/C Cores installed and re-combinated. Filing cabinets, desk drawer locks, time clocks and more. Door Closers installed. This includes surface mounted and concealed. Door Pivots and Continuous Hinges installed. We service all major brands of locks and Panic Devices. Here are examples of some of our specialty items. 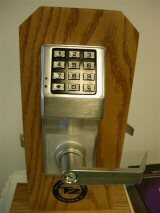 Schlage - Locks, restricted keyways and Primus high security key systems. Von Duprin - Exit control systems. 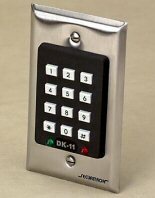 OSI - Omnilock pin pad and card swipe electronic access system. Securitron - Magnetic locks and electric strikes. 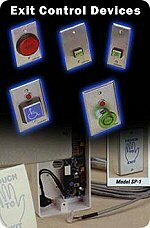 Detex Alarms - Exit alarms systems. Alarmlock - Stand alone access control. Best, Falcon, Arrow - Interchangeable Core locks. 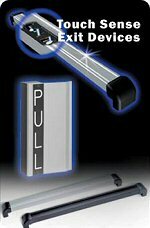 Arm-A-Door - Exit control devices. LSDA - Locks, Door Closers, Hardware. Medeco Locks sold and services - Deadbolts, Entry Knobs & Levers, Handlesets. We can secure your commercial business quickly. Ask us for a High Security Electronic Lock system today!